Today is Papertrey Ink's monthly Blog Hop. The colors in this months inspiration photo are two of my all time favorite. 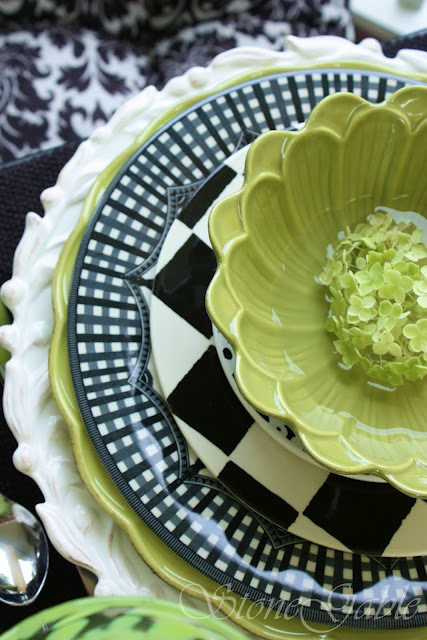 You just can't go wrong with black and green. For my card I used this sketch from Freshly Made Sketches from a couple of weeks ago. For the longest time I never used sketches...what was I thinking?? Talk about taking some stress out of the process. You can kind of see the argyle embossing on the black paper in the photo. I attached the black cardstock to my card using my dots and the oval is attached with foam tape. I love using both because it adds so much dimension to my cards. Thanks for stopping by and have a great day. I'm off to check out what everyone else has been creating. So beautifully put together. Everything is just perfect. Fabulous card, Deanna Jean! I love your mix of patterns! Great take on the inspiration challenge! So beautiful!!! I just love your take on the challenge today, so creative. Sooo pretty Deanna, yes I do see the embossing on the black. Very elegant card! Love it! Your card is wonderful! I love your design. I found the embossing on the black when I shielded the glare from my computer screen (my computer is in the kitchen, where it is very bright.) A super interpretation of the sketch. I especially love the big oval, it's a big statement! Love your blog, too. I was gushing over that inspiration photo this morning....just love it! And you interpreted it oh so well! Isn't argyle just the best! I really like how you used the argyle impression plate. Super job! so pretty!! love that argyle! Deanna what a beautiful card. 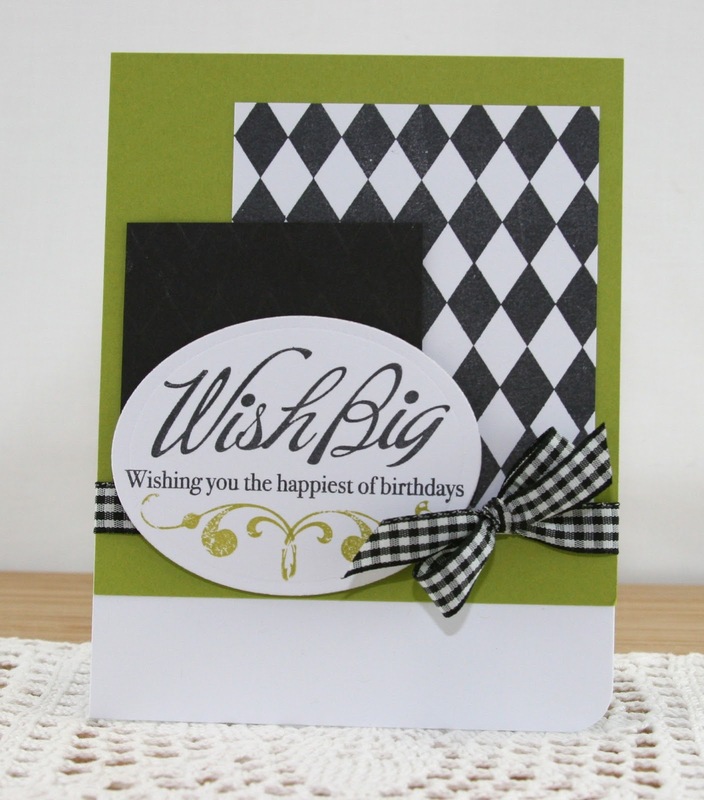 That sentiment is perfect, your argyle embossed panel and argyle stamped panel--all gorgeous. Have a wonderful holiday weekend! Love the argyle stamping and impression! Your ribbon is perfect! Don't you just love sketches. I managed to make my card fairly quickly this morning just before the hop started with my sketch. Whew! This is such a sharp looking card! 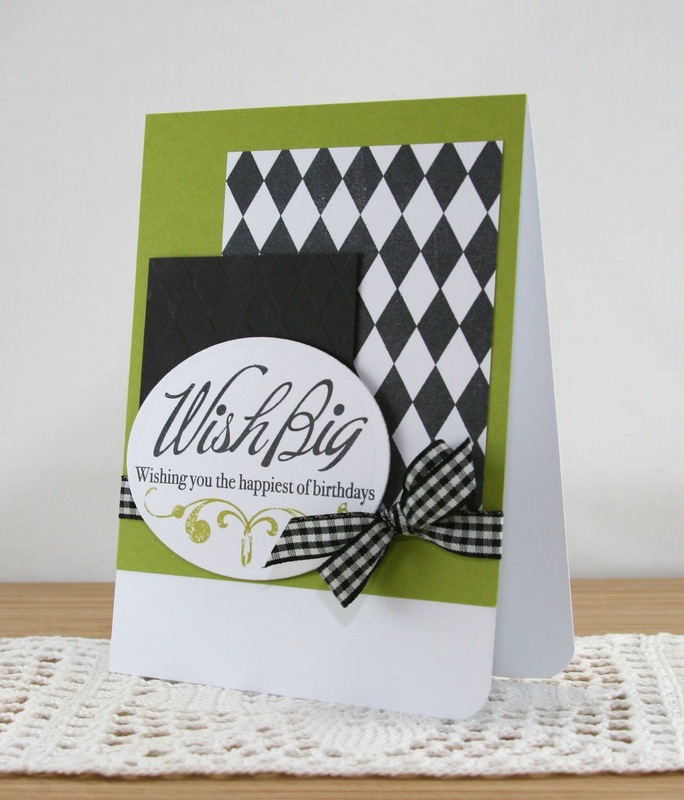 I love the bold argyle with your pretty stamped sentiment and bow! I love the argyle pattern that is on both the stamped panel and the embossed panel. So pretty! Great card, I especially like the argyle patterns. Your stamped and embossed argyle designs really go well together. The chartreuse layer on your card base really stands out, and your oval sentiment with the gingham ribbon finishes it off nicely. Great interpretation of the challenge! WOW! is right! This is amazing! I love each of the design elements you added in! Great job my friend!